Much can be gained from our fears. 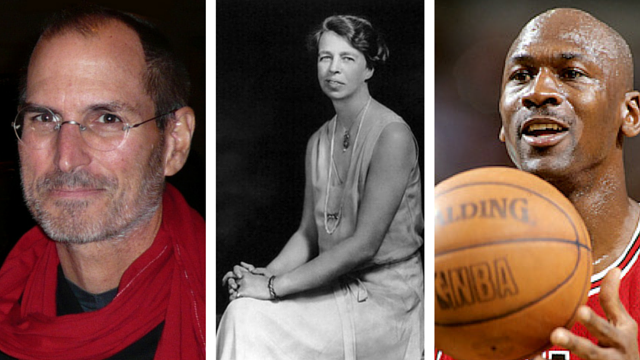 Steve Jobs, Michael Jordan and Eleanor Roosevelt walk into a bar—there’s probably a really good joke there. The three admired and celebrated figures from different walks of life and eras do have one thing in common—their ability to put fear in its proper place and perspective. Each one has been quoted on this omnipresent, but often neglected, subject. Their philosophies provide lessons from which we can all benefit. The Eleanor Roosevelt statement on fear is particularly powerful because of the perspective it puts on a somewhat taboo topic. The classic image of a leader is someone who is fearless, never admitting to being scared—the person who stoically stares down the scariest of situations without flinching. With ice-water running through their veins, they calmly save the day, leaving the rest of us to wish we were born with the same innate ability. However, the manner in which one responds to fearful situations is likely a combination of one's experiences and environment. In other words, it is something that can be taught, learned, and developed. The former first lady put further perspective on the topic by not only acknowledging that fear is real, but that one can actually grow from it. In Steve Jobs' famous commencement speech to the 2005 Stanford graduating class, he did not directly use the word fear, but he mentioned a unique tool against the fear of failure in particular. "Remembering that I’ll be dead soon is the most important tool I've ever encountered to help me make the big choices in life. Because almost everything—all external expectations, all pride, all fear or embarrassment or failure—these things just fall away in the face of death, leaving only what is truly important. Remembering that you are going to die is the best way I know to avoid the trap of thinking you have something to lose. You are already naked. There is no reason not to follow your heart." Think of a small child who is scared to try something new. Mom or Dad encourage the child to jump off the diving board, pedal a bike without someone holding on and running alongside them, or take a bite of a new food for the first time. After the child takes the leap of faith, they often emerge with a smile on their face. This prompts, Mom or Dad to say, "See, it wasn't that bad, was it? Aren't you glad you gave it a try?" As children, we need constant pushing against the mental imagery that somehow gets installed in our minds of failure. Parents realize that getting a child out of their comfort zone is crucial for their development. Left to their own devices, some kids will stay within the confines of what is certain, forsaking all the fun, growth, and maturation that facing a fear brings with it. As Michael Jordan referenced, many fears, outside of the ones that are critical for survival (the life endangering variety) are merely an illusion. When you stop to put most of your fears into this mindset, just like the child who acknowledges that trying something frightening "wasn't so bad," we can gain the courage to do what's right—even if it scares us momentarily. The hero, villain, winner, loser, leader, and follower all face identical fears. The difference is how the fear is processed and reacted to that determines the outcome. When facing our own fears, we should remind ourselves that the people we look up to also had fears—they just learned how to conquer them.